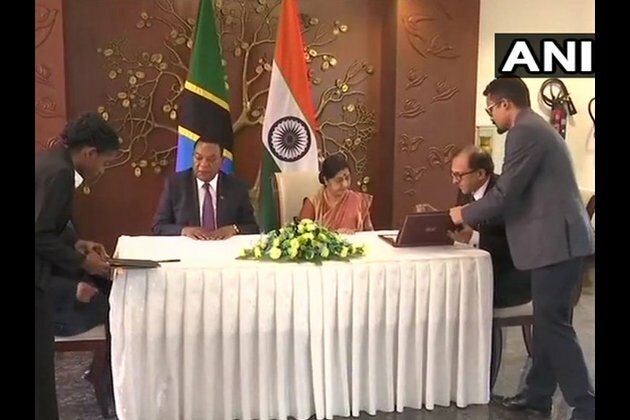 New Delhi [India] Oct 16 (ANI): India and Tanzania on Tuesday signed two Memoranda of Understandings (MoUs ) in presence of External Affairs Minister Sushma Swaraj and Tanzanian Foreign Minister Dr. Augustine Mahiga, in the national capital. The agreements were signed following India-Tanzania 9th Session of Joint Commission on Economic, Technical and Scientific Cooperation in New Delhi. The MoUs are between Foreign Service Institute of India and Centre for Foreign Relation, Tanzania and National Research Development Corporation and Tanzania Industrial Research and Development Corporation. In a tweet, External Affairs Ministry spokesperson Raveesh Kumar said, comprehensive discussion held on stepping up cooperation in trade and investment, defence and security, development partnership, Science and Technology, oil and natural gas, culture and people-to-people relations.